Those were the first words in the first “Letter from the Editors” in the first issue of Fast Company. The premiere issue appeared in November 1995, and thus began the greatest professional journey of my life. Alan M. Webber and I created Fast Company because—well, because we had an awful lot of things to say about where business of work could and should be going, and a magazine gives you a big platform to speak your mind. Amazingly, the experience of launching and running the magazine exceeded even our loftiest expectations. Over the years, Fast Company won countless awards, including two National Magazine Awards, earned a passionate following among executives and entrepreneurs around the world-and became an incredible business success. After six years, an enterprise that took shape in some borrowed office space in Harvard Square sold for $340 million. Earlier this year, Fast Company was named one of the 25 most notable magazine launches of the past 25 years. Alan and I remain exceedingly proud of our status as the cofounders of a magazine that we hope has helped to change the conversation about what business can and should become. And we both continue to campaign for a business world in which progressive and humane values lead to the creation of enduring economic value. Here are some fun links that offer a quick history of Fast Company. 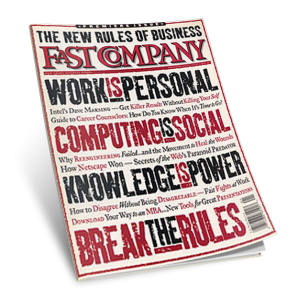 The article that put Fast Company on the map was the cover story of what may have been the single best issue we ever did. 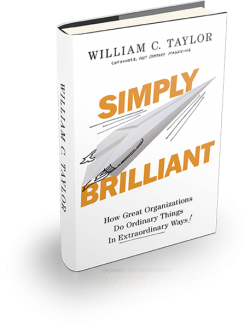 Tom Peters’ essay remains as relevant today as it did when it first appeared. In December 1998, The New York Times discovered the power and passion of the Fast Company community. Writer Alex Kuczynski visited one of our signature Real Time live events, and filed this report from New Orleans. “At times,” she declared, “the proceedings bordered on the surreal.” That was true of the whole Fast Company experience! Once again, the mainstream media tries to reckon with the growth of Fast Company. In this long essay in The New York Times Magazine, writer Tom Vanderbilt explores the emergence of the Company of Friends, clubs of Fast Company readers that took shape around the world. Remember, not just a magazine, a movement. To commemorate the tenth anniversary of Fast Company, the staff put together a fantastic “oral history” of the early days. Reading it now makes me both proud and nostalgic. And it serves as an entertaining primer for anyone interested in how and why we started the magazine. Here’s a link to the walk down memory lane.